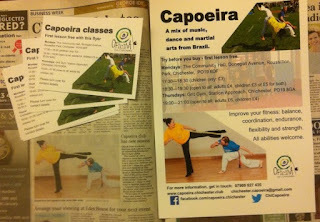 Capoeira Chichester: Thank you to Chichester businesses! Thank you to Chichester businesses! Thank you to Spirit FM who have been promoting us throughout the previous week. Whilst they will no longer be promoting us on their radio station, the half price vouchers are still available, and the last day you can buy them is Monday 14th March. As well as Spirit FM, I would like to thank the following local Chichester businesses and the Observer series for featuring us in this week's issue. Look out for the posters and flyers around Chichester, and our feature in the Observer. If you are able to display posters/flyers any where, please get in touch!